Early Learning STEM Australia (ELSA) is a play-based digital learning program for children in preschool to explore science, technology, engineering and mathematics (STEM). ELSA allows children to play, experiment and make sense of the world around them – which is part of science, and also part of being a child. ELSA’s STEM Practices encourage children to ask questions, make predictions, experiment, and reflect on what happened and why. The ELSA Pilot is a key early childhood initiative of the Australian Government. ELSA has been developed by the University of Canberra through funding provided by the Australian Government Department of Education and Training under the National Innovation and Science Agenda. It supports the ‘Inspiring all Australians in digital literacy and STEM’ measure, which seeks to increase the participation of Australian children in STEM and improve their digital literacy. Professor Tom Lowrie’s paper, STEM Practices: A translational framework for large-scale STEM education design, was recently published in Educational Design Research (EDeR) – an international journal for design-based research in education. This paper unpacks two key pedagogical underpinnings of the ELSA Pilot: STEM Practices and the ERA (Experience, Represent, Apply) model. 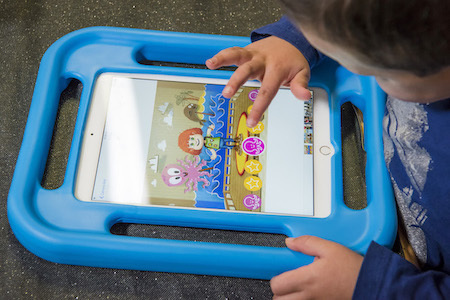 ELSA has engaged world-class Australian app development companies to create a suite of apps for preschool-aged children, early learning educators and families. App development company Two Moos, based in Melbourne, created two ELSA children’s apps: Representations and Investigations. Two Moos list Disney, Sesame Street and PBS Kids among their esteemed client list. App development company Mode Games, based in Sydney, created two ELSA children’s apps: Patterns and Relationships, and Location and Arrangement. Mode are now the preferred supplier for educational games and apps company, Scholastic, in the US. App development company Stripy Sock, based in Canberra, created ELSA’s Educator and Families’ apps. They have also developed some of Australia’s most high-profile entertainment apps, including ABC Kids iView and SBS On Demand.